When every country goes through seismic changes, so does its business environment. When Croatia became a full-time member of the European Union in 2013, it triggered a tidal wave of change for its shipbuilding sector – not least at Brodosplit Shipyard. The company was founded in 1922 following a merger of shipyards in the area and has remained at its current location since 1932. For decades, Brodosplit was a joint stock company, with the Government of Croatia as the majority holder. At its peak, it employed nearly 4,000 people and had experience in designing and building a wide range of ships for an international market. When Croatia became fully wedded to the EU, part of the membership condition was for its shipbuilding business to be privatized. This heralded the Croatian Government and Samobor-based DIV company signing a privatization contract for the shipyard. The decision to accept DIV’s offer came after the European Commission gave the green light to the shipyard’s restructuring and privatization contract. DIV took over the shipyard and accepted its debts and obligations. Achieved its own contribution to the restructuring of the Company after privatization is over 2 billion kuna (€264 million). At the time, Croatian Prime Minister Zoran Milanovic said this was a step forward in efforts to boost the Croatian shipbuilding sector’s competitiveness, and this led to an overhaul at Brodosplit, with its manpower being reduced to about 2,300. The shipyard has remained a vital part of the south-east European shipbuilding industry. Over 1 million sqm, it has three slipways, equipped with cranes and an outfitting quay of 874m in length and a maximum capacity of 170,000 DWT. Sales Manager Teuta Duletic said the shipyard, which has an annual turnover of €64 million has been responsible for the delivery of more than 450 ships in recent decades, with a total overhead load of over 10 million tonnes. These include Suezmax and Panamax sized vessels, containers, and bulk ships, with about 80% of production for foreign clients. Many of these vessels have received recognition from renowned international institutions. Its long-standing experience has enabled it to build sophisticated vessels from the passenger, commercial, container, ship transportation, liquid and bulk cargoes, freezers and dredges to other specialty types and military ships. 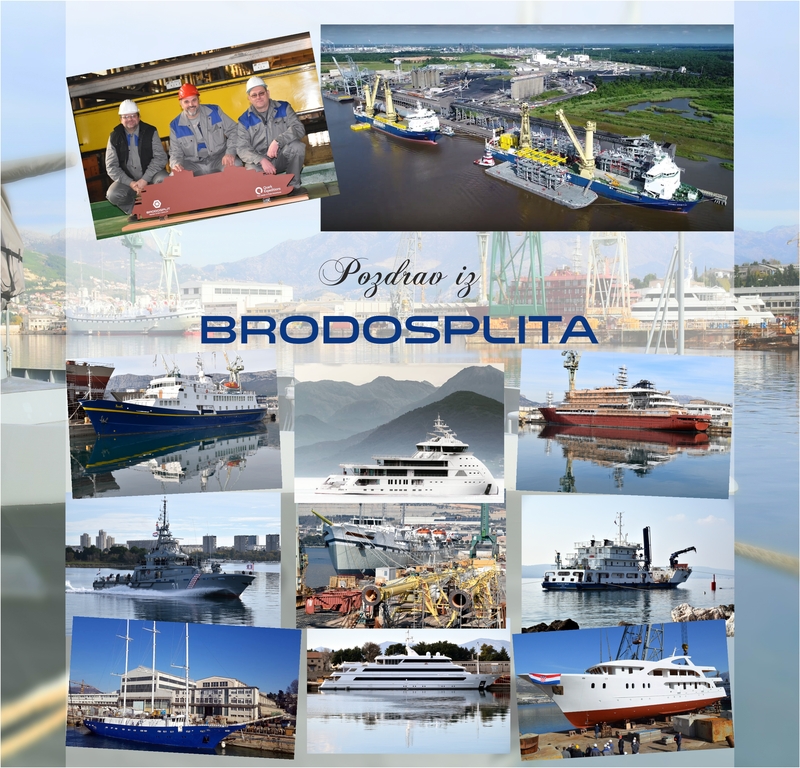 Brodosplit Shipyard has a special division responsible for the construction of numerous advanced vessels, including warships, frigates, patrol boats, landing craft and submarines for the former Yugoslav Navy and the current Croatian Navy. The shipyard has constructed offshore platforms, luxury yachts, small cruise ships, catamarans, medium-size ferries – like Jadran for Croatian shipping company Jadrolinija – as well as some specialized ships like the Bios Dva research vessel in 2009. From 1988 to 1994, Brodosplit built four large 34,384 GT ferries for different contractors. More recently, it delivered two tankers for Greek clients, vessels that were a combination of a tanker and a Ro-Ro ship. The vessels were designed and built as such so they can not only transport the oil products from the mainland to Greek islands but also transport the trucks to continue distribution across the islands too. It has also constructed a 189m juice tanker, specialized for the transportation of 32 million liters of fresh orange juice in 14 specially made, sterilized and refrigerated tanks. Amongst many other notable builds is the most expensive ship ever built at the time in Croatia upon its delivery in 2011. The $150 million price, 180m Ro-Pax vessel with twelve decks and a helipad, has a capacity for 750 passengers, with 2,500m of lanes for vehicles. And with aplomb! Brodosplit has been contracted by Star Clippers Ltd of Monaco to build the Flying Clipper – set to become the largest sailing ship in the world, with five masts and a rigging made up of square sails, when delivered in 2018. Flying Clipper has a steel construction while the deck is fully covered with top quality teak, and Brodosplit is recognized as a rare shipyard that is able to build such a unique ship from designing, building and equipping with sophisticated equipment and luxurious interior. The vessel will have five decks and 150 luxury cabins to accommodate 300 passengers, in addition to a further 74 cabins for its 150 crew members. It will be luxuriously decorated, with an atmosphere reminiscent of old sailors, and there will be room for a library, large saloons, a two-deck restaurant; a platform for water sports; an 18ft dive pool spanning two decks and an additional two pools on the top deck. “There will also be an innovative system that will be introduced in Croatia called ‘safe return to the port’,” said Mrs. Duletic. “This is a novelty in our market but has been operational since 2010 with new standards for increasing the safety of passenger ships, passengers, and crew. The Flying Clipper is anticipated to sail to all the seas of the world, and even to the Arctic and Antarctic, which is why it is built according to ice class requirements. The sailboat’s speed will be around 16 knots, and it is predicted to sail up to 20 knots with the right weather conditions. As part of the agreement, six rescue boats are planned – which will also serve as tenders – in addition to eight rafts, four sports boats and two smaller boats. Brodospilt is also building a polar cruise ship, the first ship in the LR Polar Class 6 category. It will be 107m long, 17.6m with a cruising speed of 15 knots – powered by two main engines with a total output of 4,260kW. It will be able to accommodate 196 passengers in 85 cabins. The design and all technical solutions are the work of Brodosplit’s project designers. The ship will be equipped with stabilizers and is highly suitable for advanced and innovative exploration trips in the Arctic and Antarctic, complete with 15 inflatable boats and associated equipment. According to Brodosplit, the vessel will enable those onboard to fully walk the glaciers above and below the sea level, maximizing the experience of the guests observing this unique biological and animal world. It is slated for the Arctic season in March 2019. Brodospilt is also embarking on its 12th mini cruiser in the passenger ship class to support programs for domestic nautical tourism. It has also signed contracts for the construction of 63 steel dams to be installed at the Malamocco, Chioggia and San Nicolo seaports, which go through the Venice Lagoon to Venice, to stop the impact of tidal flow through the city. And not stopping there, the company has launched the prototype of a patrol boat for the Croatian Ministry of Defense. On completion, another four will be scheduled. As a special feature, the optimization of marine systems is emphasized on these boats, and a single loading of fuel will enable them to sail 1,000 nautical miles. “The broad range of projects that we are embarking for 2018 shows that depth of knowledge, training, and quality that our workers have undergone to continue making Brodoplit a world-renowned shipyard,” offered Mrs. Duletic. “It is long a long-standing tradition at the shipyard to be open to innovation and maintain a deep level of commitment to each and every vessel we are engaged on. We believe that delivering a reliable, flexible after-sales service is also extremely important and we often find that long-term relations with clients often flourish because of this. “We are utterly transparent in all our processes and are highly motivated. But we understand that as the shipping world trends change, so do we and change are what Brodosplit welcomes with open arms.